As I have stated before, I LOVE Sunny Anderson’s recipes! What do I love more than her recipes? PEANUT BUTTER! One morning a few months ago I wanted some pancakes. Unfortunately, there wasn’t a box of mix in the pantry. So sad. Then I got online to research homemade pancakes and ran across this Peanut Butter Pancake recipe. It was deliciously simple my friends. Well, I made them again Sunday morning. Just as good as the first time. Although, this time, I ramped up the Peanut Butter content. This redhead gets what she wants, and when she wants more PB, she gets it! I luckily had enough leftovers for my breakfast at work Monday morning. I took them and no one wanted to try them. Now, I must say, I always have people wanting to try my food at lunch. While heating the leftovers, I always grab 3 or 4 forks on the way back to the table for tasting. It’s just how we do it. We must remember this though, we all have some things that don’t quite sound good to us, but they are always worth the try. Our household loves them and definitely thinks you should try making them on your own. You can top them with anything you can think of. 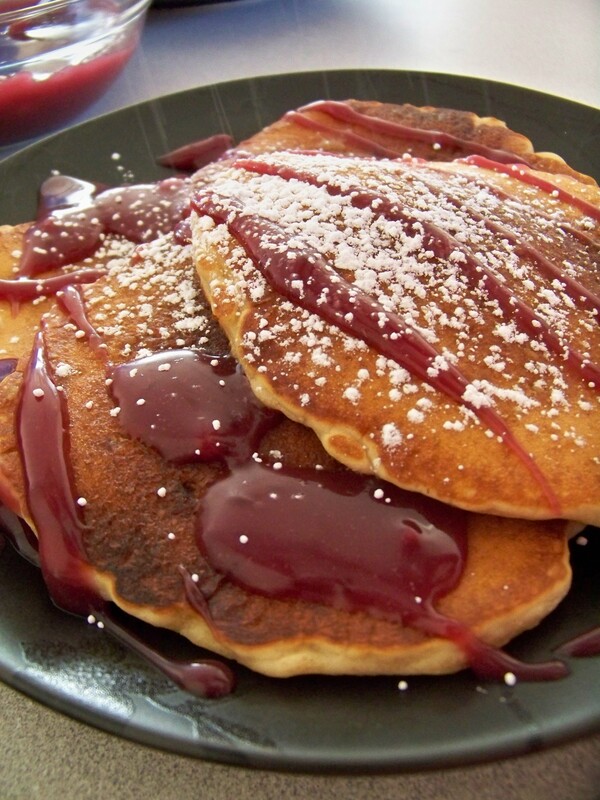 The first time I heated some grape jelly on the stove and reduced it to a nice syrup texture. Sunday morning I warmed some Sugar Free Polaner’s Raspberry Jam. Monday morning, I topped them with fresh blueberries. When I warmed them in the microwave at work, the blueberries popped open and made a nice topping. In fact, I highly recommend the blueberries. The recipe below includes Sunny’s topping recommendation (I preferred something easier). Just get creative with it! I LOVE peanut butter!! Make me some please!